A study in dolphins has revealed genetic clues that could help medical researchers to treat type 2 diabetes. Scientists from the US National Marine Mammal Foundation said that bottlenose dolphins are resistant to insulin - just like people with diabetes. But in dolphins, they say, this resistance is switched on and off. The researchers presented the findings at the annual meeting of the American Association for the Advancement of Science (AAAS) in San Diego. They hope to collaborate with diabetes researchers to see if they can find and possibly even control an equivalent human "off switch". The team, based in San Diego, took blood samples from trained dolphins that "snack" continuously during the day and fast overnight. "The overnight changes in their blood chemistry match the changes in diabetic humans," explained Stephanie Venn-Watson, director of veterinary medicine at the foundation. This means that insulin - the hormone that reduces the level of glucose in the blood - has no effect on the dolphins when they fast. In the morning, when they have their breakfast, they simply switch back into a non-fasting state, said Dr Venn-Watson. In diabetic people, chronic insulin resistance means having to carefully control blood glucose, usually with a diet low in sugar, to avoid a variety of medical complications. But in dolphins, the resistance appears to be advantageous. Dr Venn-Watson explained that the mammals may have evolved this fasting-feeding switch to cope with a high-protein, low-carbohydrate diet of fish. to keep the brain well fed". But other marine mammals, such as seals, do not have this switch, and Dr Venn-Watson thinks that the "big brain factor" could be what connects human and dolphin blood chemistry. "We're really looking at two species that have big brains with high demands for blood glucose," she said. "And we have found changes in dolphins that suggest that [this insulin resistance] could get pushed into a disease state. "If we started feeding dolphins Twinkies, they would have diabetes." Since both the human genome and the dolphin genome have been sequenced, Dr Venn-Watson hopes to work with medical researchers to turn the discovery in dolphins into an eventual treatment for humans. 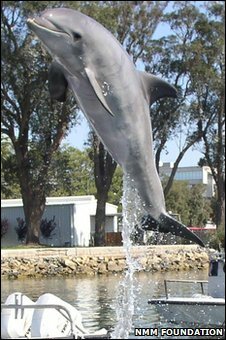 "There is no desire to make a dolphin a lab animal," she said. "But the genome has been mapped - so we can compare those genes with human genes." Scientists at the Salk Institute in San Diego have already discovered a "fasting gene" that is abnormally turned on in people with diabetes, "so maybe this is a smoking gun for a key point to control human diabetes", Dr Venn-Watson said. If scientists can find out what switches the fasting gene on and off in dolphins, they may be able to do the same thing in people. Lori Schwacke, a scientist from the National Oceanic and Atmospheric Administration (NOAA) in Charleston, South Carolina, said that the work demonstrated that there are interesting similarities between dolphins and humans. Dr Schwacke, who is studying the effect of pollution on dolphins along the coast of the US state of Georgia, is also interested in the links between dolphin and human health. "There are several interesting diseases that you only see in humans and dolphins," she told BBC News. In this case, Dr Venn-Watson said, "the fundamental difference is that dolphins can switch it off and humans can't".